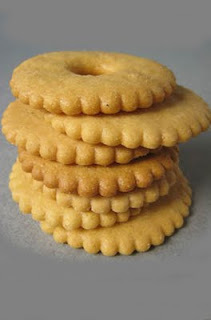 The rosquillos are cookies that originated from the Municipality of Liloan, Cebu. The cookies are circular in shape with flower-like edges and a ring shaped hole in the center. The rosquillos is a distinctive snack unique to Cebu and is a favorite snack of local Cebuanos and expatriate Cebuanos in the United States. The late Philippine president Sergio Osmeña Sr. reputedly gave the name of rosquillos from the Spanish word rosca, meaning ringlet. Margarita “Titay” T. Frasco created the rosquillos in 1907 in the town of Liloan. She later founded Titay’s Liloan Rosquillos and Delicacies Inc., the pioneer and premier company producing delicious and fine quality rosquillos in Cebu. Descendants of her family presently run the company which also produces other native snacks. Titay’s Rosquillos supplies and delivers its products to supermarkets in Cebu City and has several retail outlets in the city. Although there have been other bakeshops creating and selling their own rosquillos, many people still swear that they prefer the original Titay’s Rosquillos because of its unique and delicious taste.